How do we get the strength to go forth and actually begin the journey? It is one thing to be inspired on the mountaintop while seeing the Lord in the fire of the burning bush. But such mountaintop visions fade once we go back to the day-to-day events of our life in Egypt. How can we bring the fiery inspiration of the burning bush down into the action of our lives? Through a meal to be eaten on the eve of the journey: the feast of the Passover. When Jesus ate the Passover with His disciples just before His earthly death, He commanded us, "Do this in remembrance of me" (Luke 22:19). He re-established this ritual feast with a new purpose. Eating the bread of the holy supper is a tangible sign that the new loves a person feels are really from the Lord — that He alone provides them. When a person drinks the wine, it is an acknowledgement that He alone gives the living truth that will quench thirst and show the way. There is a practical message here. When we are finally ready to begin a new journey in our lives, when we have finally decided to take action, we need to stop on the eve of that journey and consider the power of the Lord’s presence with us. The fact is, we cannot make the journey alone; we cannot take one step without the Lord. To eat the Passover is to give our lives over to the Lord. It is a moment of surrender, a time of seeing what is the Lord’s part in the journey and what is ours. 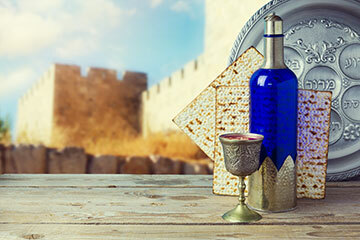 The Passover feast, re-established in the New Testament as holy communion, or holy supper, is one of the few divinely commanded rituals of the Christian faith. The communion is to be taken at a time when we are is ready to make changes. We are to eat the bread and wine with a vision of the journey that lies before us. In this time of prayer and meditation we anticipate the journey before us. We eat the bitter herbs, which is an acknowledgement that the journey will take work and effort on our part. We prepare ourselves to face the obstacles that stand in our way with courage and determination.